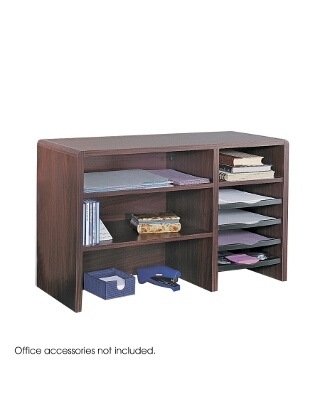 The compact multipurpose desktop organizer brings versatility and accessibility for storage and organizing in small spaces! Furniture-grade compressed wood cabinetry with durable and attractive melamine finish and a finished back, allows placement in open areas. Literature sorter includes fixed letter-size shelf, three plastic slide-out trays for easy access to contents, plus a pullout organizer tray. Organizer tray features a built-in tape dispenser, Post-It notes compartment, two front bins for small supplies plus two pencil trays. Cord cutout in back panel.